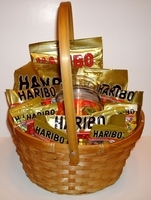 Gummi bear gift basket for the serious gummy bear fan. You get a whole basket of Haribo gummy bears. Include is a 1 4 oz bag of juicy gold bears, 2 4oz bags of gold bears, 3 2oz packs, 10 mini packs of gold bears 1/2 oz each. Not only do you get all these little bears, but also a air tight jar to keep them in. You will have plenty of Haribo gummi bears to choose from. The little 1/2oz packs are perfect to grab and go. Fill the candy jar and keep them handy for a quick gummy fix.